2018 Update: Agroventures is now called Velocity Valley. 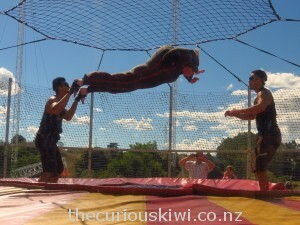 Agroventures Adventure Park in Rotorua is an outdoor temple of adrenalin, there are five ways to get your adrenalin injection – Agrojet, Freefall Xtreme, Swoop, Shweeb and Bungy. We joined a city full of locals earlier this year when Agroventures hosted Locals Weekend. Rotorua residents were generously offered $10 tickets for all activities except bungy jumping which was discounted to $50. We’d been away for the weekend and arrived at Agroventures late on Sunday afternoon to take our places in the queues. It wasn’t our late arrival that stopped us swinging on the Swoop or doing a bungy jump though, truth is we’re just not that brave. The Swoop involves being strapped upright into a harness before slowly being raised 40 metres. Someone fearless then has to release the rip cord causing a human pendulum to swing into action. Sharp intakes of breath result, and that’s just for spectators. Bungy jumping is synonymous with adrenalin in New Zealand and thanks to a bus load of encouragers and Van Halen’s song ‘Jump’ I got the t-shirt in Queenstown some years ago. 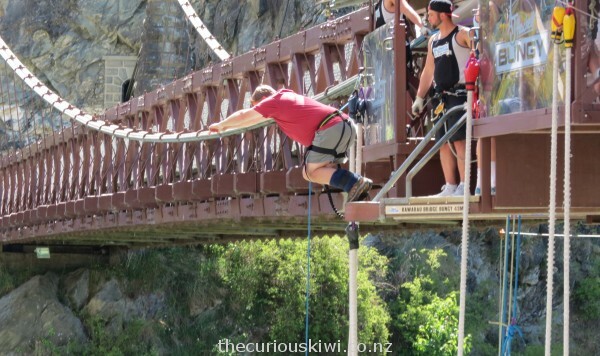 It’s an eye watering $205 to bungy jump off the Kawerau Bridge today. I’d still choose Queenstown as a bungy location, but if you buy a VIP Pass at Velocity Valley you can do all five activities including bungy jumping for $219, so it’s a great value adrenalin package. 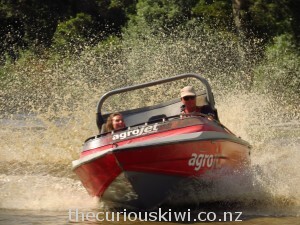 Agrojet was the first of the attractions at Agroventures and jet boats started roaring around the man made jet sprint course in 1998. With a 450 horse power V8 engine behind you, a twisty jet sprint track in front, and a guy beside you who doesn’t let up on the throttle, you’re on a wild ride. The 360 degree spin at the end of our three laps came too soon, but just like feeling the tension of a bungy cord after freefall, the spin took away the fear, except this time I wanted to do it again. Mike suited up for the Freefall Xtreme to have a go at body flying. A twin turbo Detroit engine and DC3 propellor work like a super charged hairdryer beneath you. With a few tips from the staff beforehand, and hand signals while you’re in progress, you get to try and fly, or at least hover. All that turbocharged air can do unbecoming things to your face, or make funny photos, depending on how you look at it. Mike found it difficult to get into the wind zone but as this woman shows you can get some serious wind power beneath you. Pedal power is what’s needed for the Shweeb, an invention chosen by Google for a one million dollar investment as an innovative public transport option. 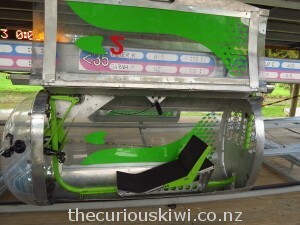 Rotorua is the only place in the world where you can lie back and pedal a plastic pod around a 200 metre track, or should that be go Shweebing? The handle bars don’t function as steering isn’t required and the only brake is operated by the staff to stop you at the station. Our late arrival meant we didn’t have time to race each other, but it’s going to happen, winning $1000 by breaking the current record isn’t though. Last but by no means least, the staff deserve a special mention. 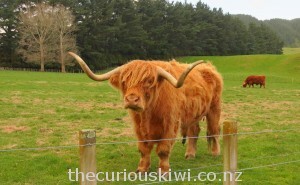 We found them to be really friendly and they do all they can to help visitors get the most out of their activities. It’s a cherry on the top when you remember not only a fun experience but also the guides who helped you make it happen. Velocity Valley is open every day from 9am – 5pm except Christmas Day. Single rides start at $49 or do all five activities for $219. 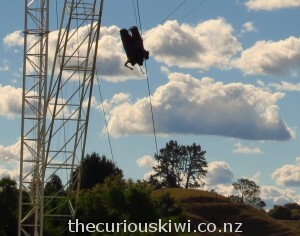 This entry was posted in Adrenalin Action, Rotorua and tagged Agroventures Adventure Park, Rotorua by thecuriouskiwi. Bookmark the permalink.